Frederik Willem de Klerk was born in Johannesburg on March 18, 1936. He is the son of Senator Jan de Klerk, a leading politician, who became minister in the South African government. His brother Willem is a liberal newspaperman and one of the founders of the Democratic Party. F.W. de Klerk graduated with a law degree from Potchefstroom University in 1958 and then practiced law in Vereeniging in the Transvaal. In 1969, he married Marike Willemse, with whom he has two sons and a daughter. De Klerk was offered a professorship of administrative law at Potchefstroom in 1972 but he declined the post because he had been elected to Parliament as National Party member for Vereeniging at the time. In 1978, F.W. 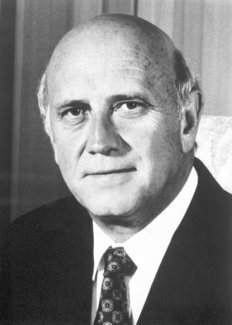 de Klerk was appointed Minister of Posts and Telecommunications and Social Welfare and Pensions by Prime Minister Vorster. Under Prime Minister P.W. Botha, he held a succession of ministerial posts, including Posts and Telecommunications and Sports and Recreation (1978-1979), Mines, Energy and Environmental Planning (1979-1980), Mineral and Energy Affairs (1980-1982), Internal Affairs (1982-1985), and National Education and Planning (1984-1989). In 1985, he became chairman of the Minister’s Council in the House of Assembly. On December 1, 1986, he became the leader of the House of Assembly. As Minister of National Education, F.W. de Klerk was a supporter of segregated universities, and as a leader of the National Party in Transvaal, he was not known to advocate reform. In February 1989, de Klerk was elected leader of the National Party and in September 1989 he was elected State President. In his first speech after assuming the party leadership he called for a nonracist South Africa and for negotiations about the country’s future. He lifted the ban on the ANC and released Nelson Mandela. He brought apartheid to an end and opened the way for the drafting of a new constitution for the country based on the principle of one person, one vote. de Klerk, Willem. The Last Trek — A New Beginning: The Autobiography. Basingstoke: Macmillan, 1998. Benson, Mary. Nelson Mandela, the Man and the Movement. Harmondsworth: Penguin, 1994. Updated from 1986 edition. Based on interviews by a friend of Mandela since the 1950s. de Klerk, Willem. F. W. de Klerk: The Man in His Time. Johannesburg: Jonathan Ball, 1991. By his brother. Gilbey, Emma. The Lady. The Life and Times of Winnie Mandela. London: Cape, 1993. Most comprehensive biography. Harrison, Nancy. Winnie Mandela: Mother of a Nation. London: Gollancz, 1985. Authorised favourable biography. Johns, Sheridan and R. Hunt Davis, Jr., eds. Mandela, Tambo and the ANC: The Struggle Against Apartheid. New York: Oxford University Press, 1991. Documentary survey. Mandela, Winnie. Part of My Soul. NY & London: Norton, 1984. Edited by Anne Benjamin and Mary Benson. eer, Fatima. Higher Than Hope: The Authorized Biography of Nelson Mandela. NY: Harper, 1990. By family friend, with Mandela’s corrections. Foreword by Winnie Mandela. M Meredith, Martin. Nelson Mandela. A Biography. New York: St, Martin’s, 1998. By an authority on South Africa. Recommended reading. Ottaway, David. Chained Together. Mandela de Klerk, and the Struggle to Remake South Africa. New York: Times Books, 1993. Critical treatment by well-informed journalist. Sparks, Allister. Tomorrow Is Another Country: The Inside Story of South Africa’s Road to Change. New York: Hill & Wang, 1995. By a distinguished South African journalist. Waldmeir, Patti. 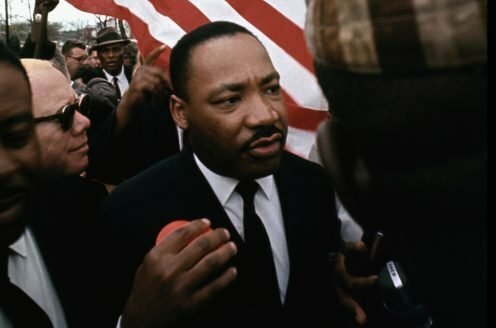 Anatomy of a Miracle: The End of Apartheid and the Birth of a New South Africa. London: Viking, 1997. As Minister of National Education, F.W. de Klerk was a supporter of segregated universities but also worked for the equalisation of expenditure on pupils from all racial groups. A centrist in the National Party, he led moves in 1982 against the extreme right wing of the party, before being elected as leader of the party in the Transvaal. In February 1989, de Klerk was elected leader of the National Party and in September 1989 he was elected State President. In his first speech after assuming the party leadership he called for a nonracist South Africa and for negotiations about the country’s future. On 2 February 1990 he lifted the ban on the ANC and all other political organisations and announced the release of Nelson Mandela. He brought apartheid to an end and opened the way for the drafting of a new constitution for the country based on the principle of one person, one vote and the entrenchment of basic human rights. After South Africa’s first universal democratic elections on 27 April 1994, Mr de Klerk was appointed as Executive Deputy President in South Africa’s Government of National Unity. He held this post until June, 1996 when his party withdrew from the Government of National Unity. From then until his retirement from active politics in 1997, Mr De Klerk was the leader of the official opposition. Mr De Klerk published his autobiography ‘The Last Trek – a New Beginning’ in January 1999 and has now established the F W de Klerk Foundation to work for peace in societies that are divided on cultural, ethnic, religious or linguistic lines.